If you are using WhatsApp as a Pro, you must be interested about how to write WhatsApp Statuses like a Pro. And I also assume, you would not feel bad, if you are provided with an opportunity to earn a few bucks from the WhatsApp Statuses. Unlike its previous version, the new version of WhatsApp let you update your statuses in a Multimedia Rich Format with better analytics. You can find more information about the it on WhatsApp Official Blog. Update statuses in Text, Audio, Video, Image and Multimedia Format. Check how many (and exactly who) people visited your last status. Get comments on your latest WhatsApp Statuses from your beloved ones. The only thing that some users found annoying that the new Multimedia WhatsApp Statuses last for 24 hours only. And this is exactly where the WhatsApp Pro Users like us find another opportunity to amplify our personal brands, promote our businesses more efficiently (through WhatsApp) and make more money. There are multiple ways to promote your brand and business through WhatsApp Statuses. I have decided to write a separate blog post about it on my upcoming Digital Marketing Blog. The key is here to keep your Contacts engaged and hooked up with your WhatsApp Statuses every now and then. Brand Video: Set your Brand Videos as your WhatsApp Statuses. Special Offers: Set your Special Offers as your WhatsApp Statuses. Personal Updates: Set your Personal Updates as your WhatsApp Statuses. Favorite Quotes: Set your Favorite Quotes as your WhatsApp Statuses. Liked Audio Clips: Set your Liked Audio Clips as your WhatsApp Statuses. Think for one second practically. Is it really possible to post these kinds of things everyday, especially if you are a solo-marketer? Because your Daily To-Do List is fairly long. I can feel it. To fix the issue mentioned above, my friend Mr. Abhinav Jain has started up WhatsStatus.Com – the Largest Online Community of WhatsApp Statuses in July, 2016. 1) They add new statuses daily. 2) All of their statuses are unique and new. 3) They’ve thousands of Professional WhatsApp Status Writers. 5) They’ve over 16,000 Published WhatsApp Statuses and counting. 6) They also have paid over Rs. 17,000 to their WhatsApp Status Writers till date. The most important (and unique) thing about WhatsStatus.Com is you can use their WhatsApp Statutes for absolutely FREE without any limitations. It is just a matter of Copy and Paste. In fact, you can make money with them. More about this is coming soon. You can use WhatsStatuses Statuses either like an amateur or like a pro. If you want to update your WhatsApp Statuses like an amateur, simply copy your favorite status from WhatsStatuses.Com, Paste it to your WhatsApp Status Text Box and Save everything when you are done. Boom! You are ready to go as a WhatsApp Amateur. But, what if, you want to leverage the benefits of the New WhatsApp Statuses like a Pro? The simplest way to do it to produce some “TextoGraphs” using tools like Adobe Photoshop, Canva, etc. with the WhatsApp Statutes taken from WhatsStatus.Com and set them as your Daily WhatsApp Statuses. Thanks to my friend Mr. Abhinav Jain for coming up with the unique concept of PayPerStatus Model of Payment to the WhatsApp Status Writers. Yes. With WhatsStatus.Com, you can not only use their WhatsApp Statuses for Free, but also make money as a Paid Contributor to the Largest Online Community for WhatsApp Statuses. Their payment structure is pretty simple. They will pay you Rs.1/Approved Status up to 200 WhatsApp Statuses and Rs.2/Approved Status from 201th WhatsApp Status onward. Really interesting concept of making money from WhatsApp Statuses. Right? 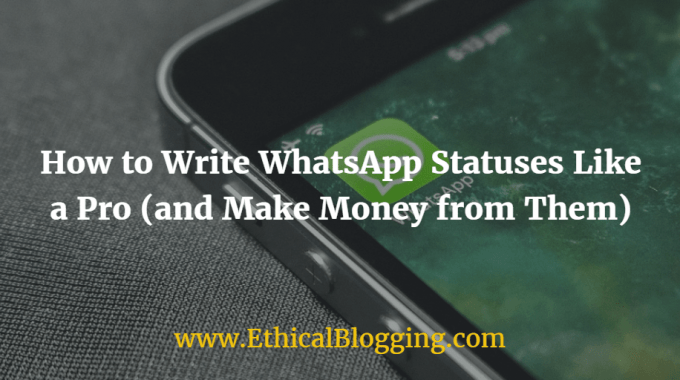 I have summarised all the information you need to know right now to Write WhatsApp Statuses Like a Pro (and Make Money from Them) here in this post. Or, perhaps, you have already signed up for free using the Signup Link given above and made a few bucks with WhatsStatus.Com. I am waiting to hear another success story from you with WhatsStatus.com. Please do share your personal experience with WhatsStatus.Com by leaving a Quick Comment below. Kindly share this post with all of your WhatsApp Contacts and help them to write WhatsApp Statuses like a Pro for Free while making a few bucks from it too. This is a Sponsored Post by: WhatsStatus.Com. Opinions are still personal.